I’ve never eaten at Da Fiore, acclaimed by many as Venice’s best restaurant. That said, to me, the best restaurant in Venice has got to be Corte Sconta, a gorgeous cult eatery hidden away—appropriate given that the name translates as “hidden corner”—on a tiny lane in the Arsenale sestiere. I only discovered Corte Sconta late last year, and boy was I upset. Upset that I hadn’t discovered it earlier. Upset that over the last decade of visiting this enchanted city, I’ve had to endure an enormous number of crappy restaurants (which are the majority here). Finding Corte Sconta was a revelation. Akin to listening to Sgt Pepper’s Lonely Hearts Club Band for the very first time; reading The Princess Bride for the first time; a first ever viewing of Before The Rain; finally seeing Desmoiselles D’Avignon in person; trying on a Giorgio Armani tuxedo for the first time or, for the ladies, slipping on that first pair of Manolo Blahniks; the first-ever taste of top quality toro sushi or sashimi; or that first sip of a Quintarelli Amarone. In other words, it’s one of those life-changing first experiences that makes you realize you just may have been missing out on some pretty amazing things for most of your life. Yesterday, I brought some colleagues there for lunch. Despite its hard-to-find location, Corte Sconta is always busy. In fact, when I called up for a table, I was told that they were booked full every night for the next 2 weeks. Fortunately, the owners squeezed us in for a late 130pm booking. We started our meal with several shared appetizers. Plates of anchovies, wild salmon, and spider crab pate were followed by a large bowl of steamed clams. A mixed seafood plate was put down on the table next. There was crayfish, scampi, baby octopus, sardines, squid, and scallops. This was in turn followed by a large plate of spider crabmeat, deshelled and tossed with olive oil and lemon. Pasta was next. There were 4 choices available. I had some gnocchi with crayfish (pictured above), which was stunning. For dessert, we shared some tiramisu and a caramel basket filled with lemon sorbet (pictured below). We also split a bottle of the house Prosecco. In addition to the amazing food, I adore Corte Sconta’s courtyard (top picture), one of the prettiest I have ever seen in any restaurant. 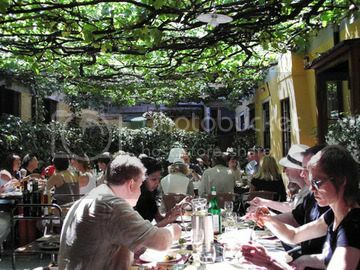 It’s the perfect setting for a Spring-Summer lunch and fortunately for us, the weather held up beautifully. What a gorgeous place to while away an afternoon. It seems an idyllic setting for some mouth-watering food! I'm so very jealous. 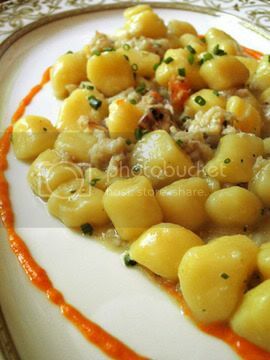 does that gnocchi taste as fantastic as it looks? Just last week, my husband and I had the opportunity to have lunch at this gorgeous place. In fact, because we didn't make any reservations, we waited outside the restaurant till it opened at 12.30pm to get a place! Thanks Chubby Hubby for this wonderful recommendation. The place was beautiful with vine leaves shading us from the hot summer sun. And the food was … well … what can I say … perfect! We had the appetizer selection (so yummy I wish the portions were bigger! ), a tagliatelle with zucchini flowers and zucchini which are in season now, followed by mains of venetian-style tuna with onion and a monkfish with bacon and endive. 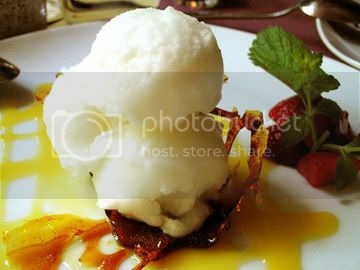 Desserts were executed perfectly with the pear and ricotta filo pastry accompanied with a lovely milk ice-cream. Can't recall what the husband had but it was yummy too. As I'm writing this, I wish were back there right now to have another go at the food! I wish I was there too. So glad you liked it.